We watch the skies and wonder. Will it happen this year? Will it rain in the late winter? Will it continue into the early spring? What are the rainfall totals? When will it happen? 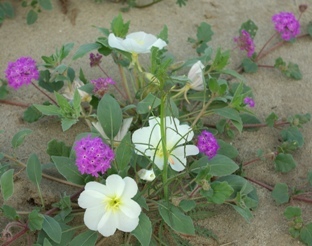 Every year the desert dwellers wait and watch to see if the town of Borrego Springs will again host scores of visitors’ intent on one thing… Wildflowers! This year we have had enough rain to produce a spectacular bloom in Anza-Borrego Desert State Park®, which surrounds Borrego Springs. This is great news for a town that relies on tourist dollars. When the flowers bloom it is like living in an amusement park. Our quiet town undergoes a transformation. The streets swell with throngs of happy people drinking in the rare, and remarkable beauty of a desert draped in color. 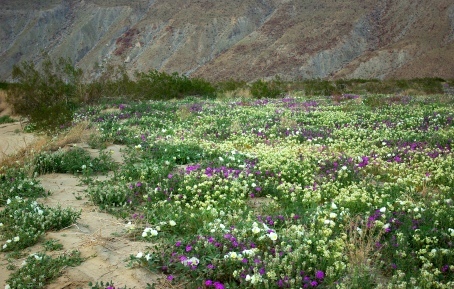 The poor economy that is weighing on everybody will be less severe for Borrego Springs now that the flowers are coming. We are ready for the visitors and grateful for the coming onslaught. The desert comes alive when the flowers bloom. Insects, mammals, birds, and people alike seem to rejoice in the beauty and bounty that only a wet spring in the desert can bring. Check in at the Anza-Borrego Desert State Park® Visitor Center or call (760) 767-4205 for the best places to view flowers. Look for flower activities online or call our institute at (760) 767-4063. If you would like your own Naturalist for a bus or group we can arrange a Step-On Naturalist for you (760) 767-4961. The last week in February and first two weeks in March should show the best bloom. If the rains continue, the blossoms may even last into April. For up to the minute information call the Anza-Borrego Desert State Park® Wildflower Hotline (760) 767-4684 or visit the Web sites www.parks.ca.gov search for Anza-Borrego™ or the www.theabf.org wildflower page or join our e-mail list and get flower alerts sent directly to your inbox. Welcome to the desert in spring. Bring your camera!